Baldur’s Gate is one of the most revered RPG series in video game history. It helped write the book on Western-style RPGs, putting a focus on memorable followers and party-based combat, and tossing it all in a blender with a dungeon and a dragon. Nearly two decades later, it’s back. This piece originally appeared 3/31/16. Beamdog is a small studio, but they have grand—verging on grandiose—plans. The company was founded by Trent Oster, BioWare co-founder, and Cameron Tofer, former BioWare lead programmer. They’ve been quietly tinkering away on Enhanced Editions of classic BioWare and Black Isle RPGs like Baldur’s Gate, Baldur’s Gate II, and Icewind Dale, culminating in today’s release of an all-new expansion, Baldur’s Gate: Siege of Dragonspear. Oh, and they also recently brought on David Gaider, aka That Guy Who Made A Lot Of The Best Words In Dragon Age And Other BioWare RPGs For 17 Years. You might be sensing a trend here. Beamdog is made up of people who either lived the late-1990s RPG golden age or loved it, and they want to pick up where it left off. This is neither here nor there, but no, I don’t know what a Beamdog is either. The Enhanced Editions? Those were phase one, a means of getting the ol’ Infinity Engine sea legs back. I’m not being (entirely) metaphorical when I use that terminology, either. You see, many of the assets used in the original Baldur’s Gate games literally drowned. 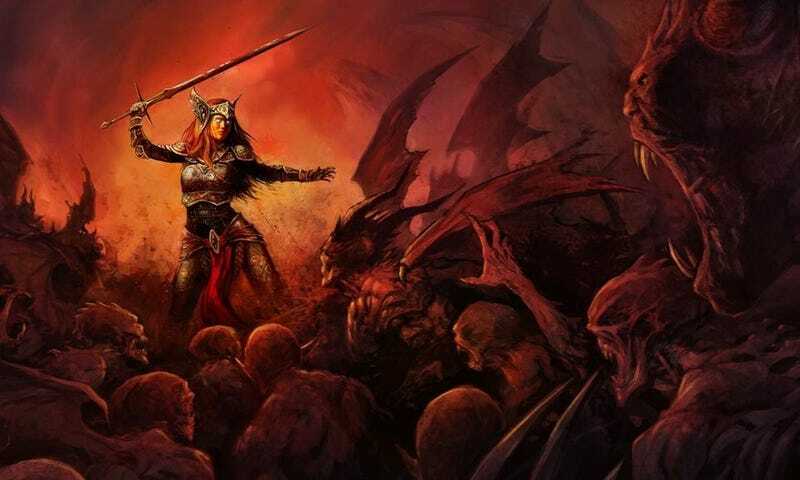 The video game industry does a notoriously terrible job of preserving its history, so Beamdog had to start almost from scratch, reverse-engineering their own tools to remix and remaster games BioWare and Black Isle created many years ago. In some cases, it was a more... obtuse process than in others. Daigle showed me a crowded town square, a bustling city center writ large in dilapidated cobblestone. It looked nice, even by modern day graphical standards. Once upon a time, though, it was coffee. He went on to tell me that Beamdog had to reverse-engineer basically everything: new character sprites, rigging, levels, camera angles/distance, and even fake camera lenses. “I think we’re about 90-95% new code at this point,” said Beamdog president Trent Oster. They also had to create a new style guide, a tome to reference when asking, “Is this thing we’re making in the spirit of Baldur’s Gate?” It was all a very long, sometimes arduous learning process. So that was phase one. Now, though, Beamdog is on phase two. Baldur’s Gate: Siege of Dragonspear is the first wholly original creation to come out of Beamdog. It’s an expansion to the first game in the series, meant to bridge a pretty large story gap between it and the sequel. At the end of the first Baldur’s Gate, you’re a hero, having defeated your half-brother who had designs on becoming the next Lord of Murder (cool guy, a real hoot at parties). At the start of the second game, you’re being tortured in a cave. Clearly, something happened there. Siege of Dragonspear explores that something while also giving more depth to the game’s world and characters and, of course, bringing back some old favorites for a farewell tour. It’s roughly 30 hours long, no small undertaking. “Throughout the development, we were constantly asking ourselves, ‘How can we make this more tied to the story? More tied to Baldur’s Gate 1 & 2?’” said Daigle. The goal was to make it all feel seamless, as though this expansion was dug up from a tomb of video game relics dating back all the way to the ancient 1990s. The writing style, the tone, the voice acting—everything had to be on point. That’s where spending years remaking the original games paid dividends. They even got people like Jennifer Hale and Jim Cummings to reprise roles they feared they’d forgotten. Beamdog did, however, have a little guidance from the past. They managed to unearth an old document of requests players made of BioWare after Throne of Bhaal, Baldur’s Gate II’s expansion, came out. Thus, the titular Siege of Dragonspear, a scene from which Daigle walked me through. Sure enough, the battle was packed and chaotic, but, true to classic BioWare RPG form, informed by decisions Daigle had made earlier in the game. He’d made the choice to explore caverns beneath Dragonspear Castle, at which point he planted an explosive potion beneath the front gates. It certainly ended up coming in handy. Beamdog’s devotion to the past is not, however, slavish in nature. While prized in gaming circles as though a holy grail or a landfill-fresh copy of ET for the Atari 2600, Baldur’s Gate is not a perfect game. After working for years to optimize the originals, Beamdog knew this all too well. Siege of Dragonspear, then, is also significantly more modern than its grunge-listening, AOL-browsing fore-bearers. Some of that comes down to interface and graphics. The UI is streamlined, character sprites have outlines for better visibility in combat, pausing mid-combat gives the environment a grayscale overlay, again making it easier to see what’s going on, and of course, the game looks and sounds nicer. But narrative and characters also got some touching up. There’s also four new companions, one of whom is gay, one of whom is bisexual. There’s even a monster companion, a throwback to a Baldur’s Gate II easter egg. But it’s not just about representation for representation’s sake. Beamdog wanted to give players options. Phase one: remaster old games. Phase two: make new expansion for old games. You can probably guess what phase three is. If all goes according to plan, Beamdog wants to make their own game, and they sure hope it will be Baldur’s Gate III. Beamdog president Trent Oster emphasized that doing the Enhanced Editions and Siege on Dragonspear has also been a means of cultivating a strong relationship with Wizards of the Coast. Siege of Dragonspear, he said, was very much an ongoing collaboration, a back-and-forth conversation especially when it came to matters of lore and how to best leverage obscure portions of the D&D universe. Despite all that, nothing’s set in stone. I asked Oster if Beamdog has considered the possibility of going their own way, making their own universe fantasy universe. He doesn’t want to leave the past behind, he told me. Not yet. But what about the ornery old Infinity Engine Beamdog’s been slowly gutting and replacing with newer, better guts? Surely there’s a temptation to build out a shiny new engine, ala the one the aforementioned Pillars of Eternity used, right? Beamdog has mixed feelings on that front. So then, there it is: Baldur’s Gate III with all textures made from different exotic coffee grounds, confirmed for 2036.